Don’t settle for dull off-the-shelf storage bins. Customize fabric bins to accent your home décor, or dorm room décor, by selecting coordinating fabrics and sewing your own fabric bins! Made from simple rectangle and square fabric pieces—the sewing is enjoyable and the end result is as fresh in appearance as it is useful. This Fabric Bin project is demonstrated in part two of the Sewing With Nancy TV show, Sew Simple with Rectangles & Squares. You’ll also find directions for bins in three different sizes, plus many other sewing projects made from rectangles and squares, in my book Sew Simple with Rectangles & Squares. Let’s take a look at how easily these go together with simple rotary cutting tools. All seam allowances are 1/2″ unless otherwise noted. Cut a 8″ x 12″ rectangle from outer fabric. Cut a 7″ x 12″ rectangle for the lining and Peltex. Mark and cut out a 2″ square in each of the lower corners. Cut a 9-1/2″ x 16″ rectangle from outer fabric. Cut a 8-1/2″ x 16″ rectangle for the lining and Peltex. Mark and cut out a 3″ square in each of the lower corners. Cut a 13-1/2″ x 21″ rectangle from outer fabric. Cut a 12″ x 21″ rectangle for the lining and Peltex. Mark and cut out a 4″ square in each of the lower corners. Note from Nancy: Today I’ll be sewing a small bin, and the small size is pictured in all of the construction steps. Machine baste Peltex to wrong side of fabric along side and lower edges. Stitch lower seam with right sides together. Press open. Stitch over center of seam with three-step zigzag stitch to hold it in position. Press paper-backed fusible web web to the wrong side of each outer binding fabric along top edge. Optional: Add an additional base of Peltex to the bottom of bin. Measure the bottom of the bin and subtract 1/2″ from the length and width to determine the Peltex rectangle size. Place paper-backed fusible web along the edges of the base. Remove paper-backing and center base over lower seam. Finger press into position. Stitch side seams; press open. Note from Nancy: Press seams over a dowel to eliminate press marks from the seam allowances. Optional: Use double-sided basting tape to hold the seams open. Fold side seams to meet bottom seam, forming gussets. Stitch gussets with 1/2″ seam allowances. Trim off excess seam allowances with decorative rotary blade or pinking shears. Stitch lining lower edge, side seams, and gusset as shown with bin, except use 5/8″ seam allowances. Note from Nancy: The wider seams allow lining to slip inside the outer bin with ease. Pin wrong side of lining to Peltex on the inside of bin. Trim top edge of bin with decorative blade in the rotary cutter, or with pinking shears. Fold under 1″ at the top of the bin along the Peltex interfacing line. Remove the paper form the paper-backed fusible web, and press the top edge over the lining to secure. Follow the manufacturer’s directions to apply the large plastic grommets. For the small bin, measure 1-1/2″ down from the top at each side and center the medium grommet (1″) over marking. Use the size specifications above, and in my book, Sew Simple with Rectangles & Squares, to create fabric bins in all three sizes. Watch Sew Simple With Rectangles & Squares on Sewing With Nancy online. Leave a comment telling us what area of your home needs the most organization for a chance to win a copy of Sew Simple with Rectangles & Squares DVD from Nancy’s Notions. 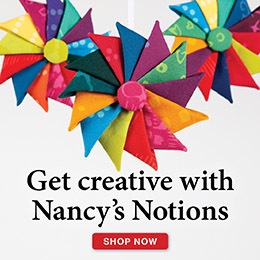 The FTC requires us to tell you Nancy Zieman has provided products by other companies in the course of her business. The FTC requires us to advise you to take this information into consideration when reading this posting. I would like to organize my daughter’s bathroom. She’s going to be a teenager in a few months and will need bins to tidy up her space. I would love to make some fabric bins for my sewing area. My sewing room and sun room both need organizing. I have a combination office, sewing room, artists studio that could really benefit from these pretty bins. My cutting station requires the a lot of effort to keep organized to maintain efficiency. Between my scissors, marking tools, templates, rulers, cutting mats, etc. if they are not within an arms reach and I have to search for them, it’s hard for me to maintain my momentum to continue progressing on whatever I’m working on. My sewing craft room needs the most organization! No matter how often I try to get it under control there are always things that need to be put away. We’re in the process of downsizing to get ready for full time RV living and this is the perfect pattern for getting organized! Very nice and handy. Love them. I need organization in my sewing room! I would love to organize my craft room with these pretty baskets rather than the plastic milk crate bins I use now. I love to do genealogy, I would love to organize my binders and folders by families so I can grab the one I need and go off to the library or local history museum. Always need long straps that are comfortable and durable. Small organizer for thumb drives would also be great. I need to organize a sewing area, and these containers are so much prettier than plain boxes! I definitely need more organization in my sewing room. These fabric bins would be perfect. Thanks for the great giveaway! I would use one in the living room to organize all the little things that clutter up the end tables. The spare bedroom where I keep my sewing fabric and supplies. These bins would be perfect! My sewing/laundry room could certainly use some organization, and these bins would certainly be pretty and useful in that space. The 3rd bedroom needs help. It’s where everything goes when we don’t know where else to put something. Thankfully I can close the door! These bins would help, for sure! We have just bought our first​ brand new home. My wonderful husband has just built me a custom sewing table under the big window in our bedroom….These bins would be perfect to organize my new sewing space! Does from the front to the back door count? Oh! Where do I start? Computer/sewing/craft room! Small bedroom where I have lots of sewing stuff and material! The list goes on! Help! My sewing room! I’ve been revamping some things and trying to make better storage areas that are easy to access while I’m sewing. I am so overwhelmed! My Whole sewing room needs to be organized!! Lol! But I especially need to make something to hold all of my embroidery hoops. I would love to see a door or wall hanging pattern that holds hoops. Thanks for the chance to win this book! I am keeping my fingers crossed as I just found some curtain grommets on clearance and bought them all and they fit so many of the items in this book.! I definitely need to add some organization like these bins onto shelves in our lower level’s “family room” (which also serves as a guest area, storage space, and overflow workshop for ironing, sewing, gift wrapping and project-planning items. My sewing room needs the most organization. Maybe a red bin for the red scraps, blue for blue scraps, etc. The bins are so cute they would add a decorative touch to my space. The grandkid’s toys and books could also use some storage as well. My computer area needs the most organizational help. I need these bins for my IKEA shelving unit. My master bathroom needs the most organization at the moment. I am going to make one today when I get off from work. I very much need advice on sorting and storing fabric, kits, sewing tools and notions. I can visualize the rectangle bins for some of my supplies but I’m in desperate need of organization. Ideas. And how to’s. I feel like a beginner. I could definitely use your book and DVD. Thanks! My sewing room needs organization. I would definitely make bins for that room. How easy Nancy makes this project!! I am encouraged by her instructions & video. Oh, how I need organization like this in my sewing room, my office and even in the Master Bath. A few coordinated fabrics bins to hold ‘like’ things would make a nice, pretty & organized statement. I would love this book and DVD. I would make medium bins for organizing my desk. Incoming mail, bills to pay, etc. so things get addressed in a timely manner. I also like other projects in the book. The room in most need of organization is my sewing room. After 40 years I’m getting a handle on it, but still have a ways to go. I am always looking for and open to new ideas. My need to organize my sewing room actually keeps me from sewing and embroidery. My little Granddaughter is 1 year old and I haven’t sewn one thing for her. I might make bins for her toys, as I make some for my Chas filled sewing room! I need to organize my dining table/sewing table so I can get more sewing done. It is also my stash table. My sewing room could use these. It is pretty organized except for my string piecing supplies. These would be great to corral those scraps! of course my sewing room needs the most organizing!!! While working on a project, I just throw the scraps onto my pile of other scraps and the bigger pieces onto the many piles of other fabric. I also need to arrange my many many patterns – whenever I want to find one it’s never where I think it is!! I need organization in every room of the house but the one that needs the most is probably the sewing room, there are so many little things that need to be put in order. Thank you for this ! my sewing room always looks like a tornado went through it – i will have to make a lot of these . . I really long for some organization in my sewing room. . . . . . I have a small back room where everthing gets piled. Been meaning for years to clean it out. Old vacation Bible school stuff,games no one plays, things just taking up space. Now that I’ve reached 60, it would make a great craft haven.Then I wouldn’t have to search all over when crafting/ sewing. I need help in all areas of my home but especially my closets and bedroom. I have a lot of quilting/sewing supplies that need to be organized into something attractive. I think they would also make great gifts. My sewing area is definitely in need of better organization. Bins here and boxes there mean I’m constantly digging through to find the fabric or tool I need. These fabric bins would be perfect for a colorful, well-coordinated work space. Right now my children’s DVD’s need help with organizations. These bins would be perfect. With cold weather just around the corner in Montana, I think making some of these bins would be perfect for my grand children to stash their mittens, hats and scarves in for the winter. They could each choose their own fabric! These could be used in lots of areas in home. Would be such a great help in my sewing room!! I plan to make some of these!! Thanks again for simple inspiration!! My sewing room needs the most help for organization. Love those baskets in the variety of sizes. Nancy, what a super solution to organize and tidy up so many areas of the home! My home is my RV and these would be perfect for every cupboard, pantry and closet. These adorable fabric bins are a match made in heaven for those things that need to be corralled and to keep spaces neat and tidy! Thank you for the small bin directions. I’ll be needing the others, I’m sure! These are very clever! And I can use up some of those wonderful fabrics in my stash that are waiting for a project in which to be used!! There is no doubt that my sewing room needs the most help for organization. When working on a project I tend to leave things where I last used them (or searched through them). My intent is always to tidy up after the project is finished. Ho! Ho! For some reason the new project always needs to start before the clean-up is complete. These fabric bins would be a good start to an organization scheme that didn’t require so much upset to find the needed tools. Thank for the information and the chance to win. My craft room is in serious need of organization! The bins are cute. Thanks for the chance to win. I would love to make these to organize our guest room which is also my sewing/craft room. They would organize and brighten the shelves I have my materials on now. Thanks for a great idea!! I can’t wait to do the holders for ipad. I will be using these for holiday gifts! Awesome project!! I think I will be getting some fabric to match home decor and making the bins for mail and keys in my home instead of leaving on the coffee table! Bin would be great for “stuff” that has to go upstairs as well. Thanks for the ideas! We have a “mud room” at the back of our house that has become our catch-all-mess-room. My husband and I built a nice long boot bench with hooks for the kids coats, shoes, hats, and gloves, but it is usually covered with backpacks, books, loose papers, socks, and a general mishmash of kids stuff (There are 5 beautiful blessings in our house!) Then the other half of the mud room has our little guinea pig and his humongous cage and all of his accessories (hay, linens, etc.) and somewhere in the middle of that is craft supply central (fabric, sequins, ribbons, lace, paint, paper, seashells, etc.) Kids stuff, mom stuff, school stuff, fun stuff, practical stuff, but in a generally disorganized mess! Yikes! We need a major overhaul in the organization department for that poor room! My craft room could really use some organizational help. The book & DVD would. E helpful . My office area really needs some organization. These bins would come in very handy! Organize every room with the fabric bins! Love the idea of using them to store items! Thanks for the opportunity to win your book of Sew Simple Rectangles and Squares! These would be so very handy on the shelves of my walk-in closet, or in my sewing room – which I’m always trying to keep organized without much success! My sewing room could definetly use organization. You are always showing us so many wonderful ideas and it is always expanding! I feel like I am forever organizing my sew room. These bins may be the answer. Wow what a wonderful idea! These would be great for a kids/teens room, as well as many others! There are so many wonderful fabrics available the possibilities are endless!! My sewing room needs the bins most, but I’m thinking the bathroom could use these bins also, then the bedroom. Love these bins-so pretty & useful! Definitely my walk-in closet-what a mess! These look perfect to organize my fabric in my sewing room. Thank you Nancy for another wonderful project! Definitely my sewing room needs to be organized. I want to organize my combination sewing/computer/craft room. There never seems to be enough room. And it looks messy. I would use PUL for lining,and use in bath or laundry. My sewing room needs the most organization. I get an idea, pull out the fabrics that might work and then, . . . I love watching your show. My sewing room needs help with organization. I spend too much time searching instead of sewing!! My sewing room needs help with organization. I spend too much time search instead of sewing!! I need to organize my closet.